Reference book on the subject. It covers well the different lantern clock makers from the 17th and 18th centuries. Published by Mayfield Books. A collector’s item in itself, this early out-of-print book is a classic pictorial reference to 1,159 ea. Values are given as of date of publication. 336 pages. This Old Clock is a text that David Goodman wrote and self-published for his for his classes on clocks. This Old Clock by David Goodman. Author David S. Goodman. If you understand what clocks do and the part that is supposed to do it and just a couple of the different ways that it is done in clocks, you will have the basis for understanding every clock, even if it is a clock -- especially if it is a clock -- you have never seen before, and you will be able to recognize and understand how that particular clock is doing it. Modern research has also contributed a great deal to earlier knowledge in the authoritative and colorful life-studies of famous makers with which the main text ends. 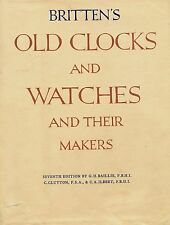 Undoubtedly one of the most comprehensive books published on the subject, this large in-depth text is a scholarly study of the history of clocks and watches, including a comprehensive list of thousands of clock and watch makers, their location, and dates of production. TEXT IN FRENCH. 1931, STRASBOURG, 514 PAGES, BLACK AND WHITE PHOTOGRAPHS AND ILLUSTRATIONS. 1972, TURNER & DEVEREUX, 24 PAGES, BLACK AND WHITE FOLD OUT PLATE. BOARDS HAVE VERY LIGHT SHELF WEAR AND ARE STRONG. PAGES ARE CLEAN AND TIGHT. 1975, BRANFORD, 844 PAGES, BLACK AND WHITE AND COLOR ILLUSTRATIONS AND PLATES. THE SUNDIAL. parallel to the axis of the Earth's rotation for the sundial to be accurate throughout the year. The style's angle from horizontal is equal to the sundial's geographical latitude. ORIGINAL 1920s TRADE - ADVERTISING CARD. In very good condition with stain, see photos. Wonderful catalogsstcard and the te two right for that special collection or decoration. INTERNATIONAL IS 7.00. 1969 "Clocks by Elliot of London " Pocket Catalog. 1969 Pocket Catalogue of "Clocks by Elliot of London". Grandfather and Grandmother Clocks. Lacquer Clocks. That is a fair policy for both of us. COVER HAS MODERATE SHELF WEAR. STAPLES ARE INTACT. PAGES ARE CLEAN AND TIGHT. SOFTCOVER- STAPLED SPINE. ############# 1962 Hardcover/jacket. no scribbling,etc. binding split a little at title page (see pic). bonus - 1968 paperback. Publication: Mason & Sullivan ; Osterville, MA. 19 printed pages [plus front/rear covers]. Well illustrated. They since have closed there doors and are no longer around. Included with this will be a single original order form from Mason & Sullivan. This is in very nice condition with some discoloration on the page edges and a small crease on the front cover Vintage Watch repair book The Watchmakers Lathe by Ward Goodrich PB 264 P Guide. Condition is Very Good. Shipped with USPS Priority Mail. 242 pages filled with black and white photos and data. No real problems noted. ORIGINAL 1920s TRADE - ADVERTISING CARD. IT WAS PRINTED IN THE 1920s. THERE IS ADVERTISING TEXT ON THE BACK! the float, and with it the index to the starting point. Ascribed to Ctesibius, about 200 B.C. IT IS LIKE NEW CONDITION. Eighteenth century at Settle, in Yorkshire. '. ORIGINAL 1920s TRADE - ADVERTISING CARD. IT WAS PRINTED IN THE 1920s. century wrote that the rock had been laid out as a giant sundial and a Samuel Buck sketch of. Square and arched dial examples are examined as well as clocks made for export to the Middle East, usually known as Turkish Market clocks. One chapter deals particularly with those rare and unusual examples which were housed in standing wooden cases. THERE IS ADVERTISING TEXT ON THE BACK! THIS CARDS IS NOT A MODERN REPRODUCTION. SLIGHT PAPER LOSS. THE IMAGE ABOVE IS LARGER THAN THE CARD. SEE SCALED IMAGE ABOVE. IT IS NOT PERFECT AND THIS CARD MAY HAVE ONE OR MORE OF THESE. 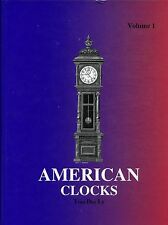 Jaeger LeCoultre Atmos Perpetual Clock Repair Manual-Out of Print-Hard to Find! Investing in Clocks & Watches by PW Cumhaill published in 1967, 159 pages. Good for identification. 17TH CENTURY STRIKING CLOCK. ORIGINAL 1920s TRADE - ADVERTISING CARD. IT WAS PRINTED IN THE 1920s. As the hours are sounded the. THERE IS ADVERTISING TEXT ON THE BACK! THE REVERSE SIDE HAS TEXT ABOUT THE IMAGE ON THE FRONT SIDE. ORIGINAL 1920s TRADE - ADVERTISING CARD. 16TH CENTURY ALARM WATCH. Towards the end Of the 16th century watches designed for use rather than to excite wonder. IT WAS PRINTED IN THE 1920s. or admiration were constructed with plain exteriors. CROMWELL'S FOB CHAINAND WATCH. the public gaze, as a short "fob " chain attached to a watch of Oliver Cromwell's, now in the. On one side of a silver plate on the seal end of the chain are the Cromwell arms, and on the. BY JERRY MALTZ. Three examples of Coca-Cola clocks are shown. BARID ADVERTISING CLOCKS. This book is new, unused, and signed by the author. I handled it carefully even when photographing. SETH THOMAS ELECTRIC CLOCK MATERIAL CATALOG and SERVICE MANUAL ; Catalog No. 1. Publication: Seth Thomas Clocks ; Thomaston, CT. Edition: 1953, January 1. Acceptable condition. Rubbing on corners and front/rear covers. 1958, CHRISTIE'S, 264 PAGES, BLACK AND WHITE PLATES. BOARDS HAVE MODERATE SHELF WEAR AND YELLOWING ON COVER SPINE. BOARDS ARE STRONG. PAGES ARE CLEAN AND TIGHT. SPINE IS UNBROKEN. Striking Clock Repair Guide by Steven Conover. Great for clock repair beginners and hobbyists. Clear instructions, many photos, and over 100 drawings. Size 9" wide x 11" high. We are more than willing to help you get what you need.